When I was running my investment firm day-to-day, we used to put together cruises for our clients. 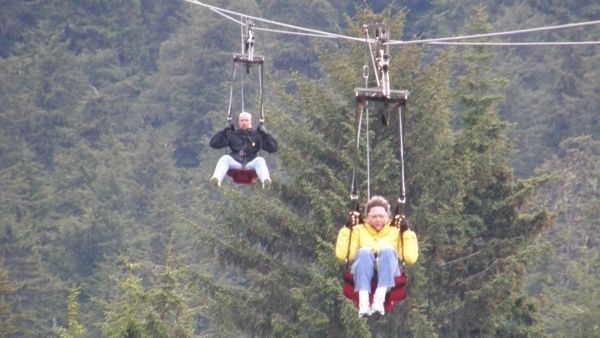 On our 2008 trip to Alaska, one of the excursions was the zip line at Icy Strait Point. At about a mile long, it claims to be the longest zip line in the world. But more than the length, the vertical drop is 1,320 feet. Top speeds are 60+ miles an hour, which you can control by opening and closing your body to increase or reduce the drag. That’s me in yellow … My husband Jim is on the left. I am a tucker. I was tucked as tight as I could the whole way down to see how fast I could go. Jim is a dragger. He was quite happy to be able to control his speed and see the sites on the way down. 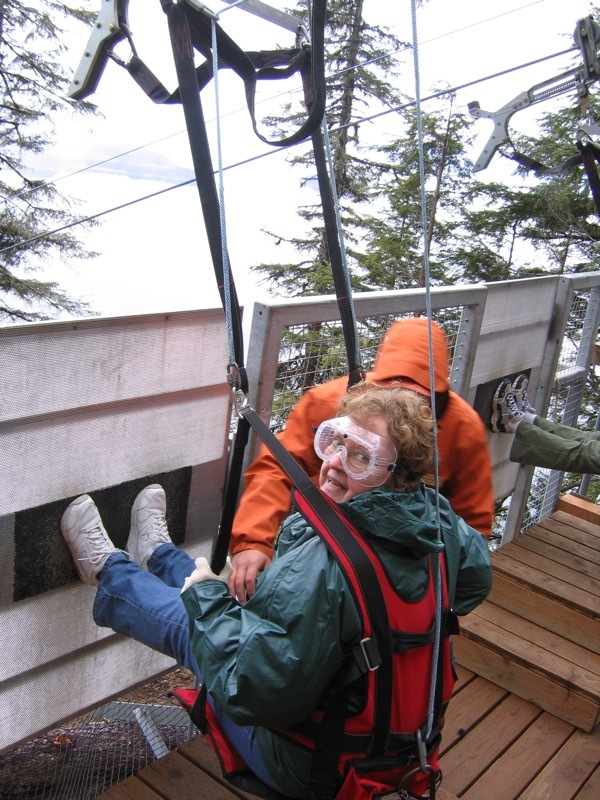 The start of this zip line is a platform, perched on a ledge. And to start, you feel like you are hurtling off the side of a cliff. Well … you are, actually. This is one of our clients about to go in front of us … you prop your feet against the platform, they hit a button and that platform drops away and off you go. The funny thing is it doesn’t matter whether you are a tucker or a dragger … no matter how much your brain tells you it is safe … and no matter how much you love things like this, it is still pretty intimidating while you are sitting there waiting for them to hit the button. And then, of course, once you do, and you are whizzing down the mountain with these absolutely magnificent views below you … Wow! You are soooo glad you trusted and took that first step. Every day I talk with people who know they need to trust enough to take that first step. But haven’t. There are all sorts of reasons why. 5. Every product and every audience is different. Figuring them out, takes time. It just does. And here is a bonus point I have been thinking about a lot lately … as much as we all want to outsource something like this (including me, I have tried a number of times), I am not sure we, as solopreneurs and microbusinesses, can. If you have been putting off Facebook advertising, the time to start is now. Do what I do. Many of you know I am a big proponent of time blocking. I have one hour in my calendar every day and a daily budget devoted to reviewing and creating Facebook ads. That hour is not for creating content or landing pages, etc. I budget time separately for that. It is for creating ads. Go ahead. Put your feet on the platform. Take the leap now. I promise a year from now you will be so glad you did. If you run into questions or are already running ads and want to help or share, I hope you will join us in the Facebook Ad Questions Facebook group. The goal is to create a great place to ask questions, network and share relevant industry content.